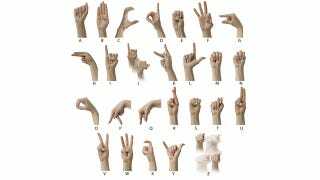 Is Technology Killing Sign Language? A byproduct of innovation and technology is that it makes once useful things obsolete. Laserdiscs, tape decks, AOL, Dreamcast and more have all been killed off with better technology. Could that happen to sign language? Some people think so. The NY Times has an interesting report on technology and sign language and it's actually becoming a contentious debate (as things tend to be when there are parents involved). On one side there's people who follow A.S.L. (American Sign Language), which include separate schools for deaf, and then there are those who believe in technology, amplifying sound and speech and assimilating the deaf to "mainstream" schools. "Today less than 20 percent of all families choose traditional American Sign Language, the remaining 80 percent want their children to enjoy the full range of sounds and to be able to listen and speak."